Theorist and composer. Little is known of his early years. He was admitted to the Jesuit University in Graz in 1680 and by 1683 was enrolled in a similar school at Ingolstadt, where he was also organist at St. Moritz in 1685-88. He may have served the Hungarian bishop Count von Kollnitsch after this time and perhaps traveled to Italy. His later posts included organist at the Schottenkirche in Vienna (by 1696-1702), court composer (from April 16, 1698), Vice-Kapellmeister at St. Stephen's (from October 1, 1705), and Kapellmeister at the same cathedral (1712-15). Charles VI appointed him principal court Kapellmeister, the most prestigious musical position in the land, in 1715; he remained in this post the rest of his life. His students included Wagenseil and Gottlieb Muffat. 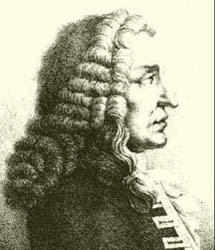 The main body of his work consists of church music (motets, three Requiems, oratorios, a double-choir Te Deum, dozens of Masses, and other liturgical pieces), but also includes some twenty operas, the most acclaimed perhaps being Costanza e Fortezza (Prague, 1723), as well as partitas, church sonatas, overtures, and keyboard works. His Gradus ad Parnassum (1725; German translation with commentary by L. C. Mizler, Leipzig, 1742) is the most influential book of its type, with masters such as Mozart, Haydn, Beethoven, and Brahms, not to mention countless students to the present day, indebted to it as a tutor for species counterpoint.